… the path to greater benefits – whether economic, social, or environmental – from nanomanufactured goods and services is not yet clear. 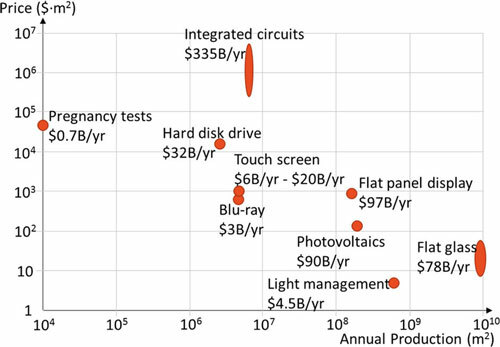 A recent review article in ACS Nano (“Nanomanufacturing: A Perspective”) by J. Alexander Liddle and Gregg M. Gallatin, takes silicon integrated circuit manufacturing as a baseline in order to consider the factors involved in matching processes with products, examining the characteristics and potential of top-down and bottom-up processes, and their combination. Although often used interchangeably, it makes sense to distinguish between nanofabrication and nanomanufacturing using the criterion of economic viability, suggested by the connotations of industrial scale and profitability associated with the word ‘manufacturing’. I find the reference to biological systems quite interesting especially in light of the recent launch of DARPA’s (US Defense Advanced Research Projects Agency) Engineered Living Materials (ELM) program (see my Aug. 9, 2016 posting). This entry was posted in manufacturing, nanotechnology and tagged bottom-up engineering, DARPA, Engineered Living Materials (ELM) program, Gregg M. Gallatin, J. Alexander Liddle, Michael Berger, nanoenabled products, nanofabrication, nanomanufacturing, Nanomanufacturing: A Perspective, top-down engineering, US Defense Advanced Research Projects Agency on September 5, 2016 by Maryse de la Giroday. In October , an interdisciplinary group of scientists proposed forming a Unified Microbiome Initiative (UMI) to explore the world of microorganisms that are central to life on Earth and yet largely remain a mystery. An article in the journal ACS Nano (“Tools for the Microbiome: Nano and Beyond”) describes the tools scientists will need to understand how microbes interact with each other and with us. Microbes live just about everywhere: in the oceans, in the soil, in the atmosphere, in forests and in and on our bodies. Research has demonstrated that their influence ranges widely and profoundly, from affecting human health to the climate. But scientists don’t have the necessary tools to characterize communities of microbes, called microbiomes, and how they function. Rob Knight, Jeff F. Miller, Paul S. Weiss and colleagues detail what these technological needs are. Life in the oceans is supported by a community of extremely small organisms that can be called a “nanobiome.” These nanoplankton particles, many of which measure less than 0.001× the volume of a white blood cell, harvest solar and chemical energy and channel essential elements into the food chain. A deep network of larger life forms (humans included) depends on these tiny microbes for its energy and chemical building blocks. Metagenomic studies show that many other less abundant life forms must exist but elude direct observation because they can neither be isolated nor grown in culture. The small sizes of these organisms (and their genomes) indicate that they are highly specialized and optimized. Metagenome data indicate a large metabolic heterogeneity within the nanobiome. Rather than combining all life functions into a single organism, the nanobiome works as a network of specialists that can only exist as a community, therein explaining their resistance to being cultured. The detailed composition of the network is the result of interactions between the organisms themselves and the local physical and chemical environment. There is thus far little insight into how these networks are formed and how they maintain steady-state conditions in the turbulent natural ocean environment. The serendipitous discovery of Prochlorococcus happened by applying flow cytometry (developed as a medical technique for counting blood cells) to seawater. (34) With these medical instruments, the faint signals from nanoplankton can only be seen with great difficulty against noisy backgrounds. Currently, a small team is adapting flow cytometric technology to improve the capabilities for analyzing individual nanoplankton particles. The latest generation of flow cytometers enables researchers to count and to make quantitative observations of most of the small life forms (including some viruses) that comprise the nanobiome. To our knowledge, there are only two well-equipped mobile flow cytometry laboratories that are regularly taken to sea for real-time observations of the nanobiome. The laboratories include equipment for (meta)genome analysis and equipment to correlate the observations with the local physical parameters and (nutrient) chemistry in the ocean. Ultimately, integration of these measurements will be essential for understanding the complexity of the oceanic microbiome. The ocean is tremendously undersampled. Ship time is costly and limited. Ultimately, inexpensive, automated, mobile biome observatories will require methods that integrate microbiome and nanobiome measurements, with (meta-) genomics analyses, with local geophysical and geochemical parameters. (38-42) To appreciate how the individual components of the ocean biome are related and work together, a more complete picture must be established. The marine environment consists of stratified zones, each with a unique, characteristic biome. (43) The sunlit waters near the surface are mixed by wind action. Deeper waters may be mixed only occasionally by passing storms. The dark deepest layers are stabilized by temperature/salinity density gradients. Organic material from the photosynthetically active surface descends into the deep zone, where it decomposes into nutrients that are mixed with compounds that are released by volcanic and seismic action. These nutrients diffuse upward to replenish the depleted surface waters. The biome is stratified accordingly, sometimes with sudden transitions on small scales. Photo-autotrophs dominate near the surface. Chemo-heterotrophs populate the deep. The makeup of the microbial assemblages is dictated by the local nutrient and oxygen concentrations. The spatiotemporal interplay of these systems is highly relevant to such issues as the carbon budget of the planet but remains little understood. The great advantage of nanoscience and nanotechnology in studying microbiomes is that the nanoscale is the scale of function in biology. It is this convergence of scales at which we can “see” and at which we can fabricate that heralds the contributions that can be made by developing new nanoscale analysis tools. (159-168) Microbiomes operate from the nanoscale up to much larger scales, even kilometers, so crossing these scales will pose significant challenges to the field, in terms of measurement, stimulation/response, informatics, and ultimately understanding. Some progress has been made in creating model systems(143-145, 169-173) that can be used to develop tools and methods. In these cases, the tools can be brought to bear on more complex and real systems. Just as nanoscience began with the ability to image atoms and progressed to the ability to manipulate structures both directly and through guided interactions,(162, 163, 174-176) it has now become possible to control structure, materials, and chemical functionality from the submolecular to the centimeter scales simultaneously. Whereas substrates and surface functionalization have often been tailored to be resistant to bioadhesion, deliberate placement of chemical patterns can also be used for the growth and patterning of systems, such as biofilms, to be put into contact with nanoscale probes. (177-180) Such methods in combination with the tools of other fields (vide infra) will provide the means to probe and to understand microbiomes. Imaging and sensing, in general, have been enjoying a Renaissance over the past decades, and there are various powerful measurement techniques that are currently available, making the Microbiome Initiative timely and exciting from the broad perspective of advanced analysis techniques. Recent advances in various -omics technologies, electron microscopy, optical microscopy/nanoscopy and spectroscopy, cytometry, mass spectroscopy, atomic force microscopy, nuclear imaging, and other techniques, create unique opportunities for researchers to investigate a wide range of questions related to microbiome interactions, function, and diversity. We anticipate that some of these advanced imaging, spectroscopy, and sensing techniques, coupled with big data analytics, will be used to create multimodal and integrated smart systems that can shed light onto some of the most important needs in microbiome research, including (1) analyzing microbial interactions specifically and sensitively at the relevant spatial and temporal scales; (2) determining and analyzing the diversity covered by the microbial genome, transcriptome, proteome, and metabolome; (3) managing and manipulating microbiomes to probe their function, evaluating the impact of interventions and ultimately harnessing their activities; and (4) helping us identify and track microbial dark matter (referring to 99% of micro-organisms that cannot be cultured). In this broad quest for creating next-generation imaging and sensing instrumentation to address the needs and challenges of microbiome-related research activities comprehensively, there are important issues that need to be considered, as discussed below. The piece is extensive and quite interesting, if you have the time. This entry was posted in nanotechnology and tagged Aaron T. Wright, atomic force microscopy, Aydogan Ozcan, big data analytics, bioinformatics, cytometry, Edward G. Ruby, George M. Church, Ger van den Engh, Gerard C. L. Wong, high-resolution imaging, imaging, Jack A. Gilbert, Janet K. Jansson, Jeff F. Miller, Julie S. Biteen, Kimberly A. Prather, lab-on-a-chip systems, mass spectroscopy, metabolome, microbial genome, microbiomes, microscopy, Miyoung Chun, nanobiomes, nanofabrication, nicrobes, nuclear imaging, ocean, Pamela A Silver, Paul C. Blainey, Paul S. Weiss, Pieter C. Dorrestein, proteome, Rob Knight, Scott E. Fraser, sequencing of microbial macromolecules and metabolites, Sharif Taha, spectroscopy, Stephen R. Quake, Thomas D. Young, Tools for the Microbiome: Nano and Beyond, transcriptome, Unified Microbiome Initiative (UMI), Zoe G. Cardon on January 7, 2016 by Maryse de la Giroday. A new low-cost, high-resolution tool is primed to revolutionize how nanotechnology is produced from the desktop, according to a new study by Northwestern University researchers. “With this breakthrough, we can construct very high-quality materials and devices, such as processing semiconductors over large areas, and we can do it with an instrument slightly larger than a printer,” said Chad A. Mirkin, senior author of the study. This paper is behind a paywall. As an alternative of sorts, you might like to check out this March 22, 2012 video of Mirkin’s presentation entitled, A Chemist’s Approach to Nanofabrication: Towards a “Desktop Fab” for the US Air Force Office of Scientific Research. This entry was posted in nanotechnology and tagged A Chemist's Approach to Nanofabrication: Towards a "Desktop Fab", Abrin L. Schmucker, AFOSR, Chad A. Mirkin, desktop nanofabrication, Desktop nanofabrication with massively multiplexed beam pen lithography, Guoliang Liu, Keith A. Brown, nanofabrication, Northwestern University, Shu He, US Air Force Office of Scientific Research, Wooyoung Shim, Xing Liao on July 19, 2013 by Maryse de la Giroday. It’s exciting when discoveries and innovations are coming fast and furious but it can be difficult to figure out exactly how to proceed. I just read about a new table-top technique for nanofabrication that doesn’t require ultra-violet light. This stands in contrast to the proposed new maskwriting facility for nanofrabrication at Simon Fraser University (SFU). The processes described in the SFU release and in the article about the table-top technique for lithographic patterning seem very similar except one uses ultra violet-light and the other does not. At this pace it seems as if the SFU facility is likely to beocme obsolete soon. Still, it’s a long way from experiments in a laboratory to industrial use as planned at SFU and I don’t imagine that it makes much sense to wait for the new process. After all by the time that’s ready for ‘prime time’ use, there’ll probably be another discovery. This entry was posted in nanotechnology and tagged nanofabrication, nanolithography, nanotechnology, SFU, Simon Fraser University, ultra-violet light on April 10, 2009 by Maryse de la Giroday.